Having heard so much about this place, I was very excited to finally have a go at it as a pre-birthday treat with some friends. Fortunately we managed to get a booking for the 2nd seating as the place runs on a full house! Loving the Southern style inspired decor. 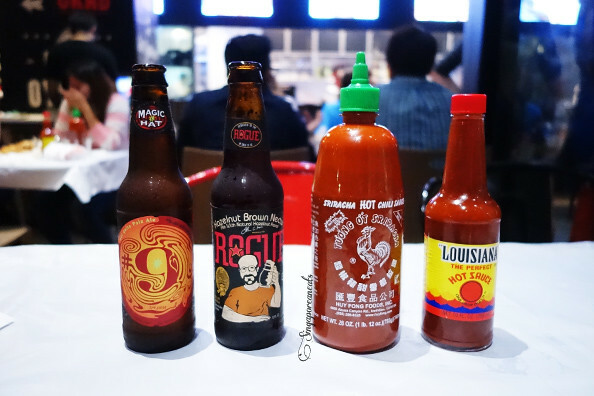 Yay for hot sauce and craft beer. We tried the Rogue Hazelnut Brown Necter and Magic Hat (both at $15 each). I preferred the RHBN for the heavier nutty flavour and my friend preferred the Magic Hat for the lighter taste. Beer Batter Cajun Calamari $9. 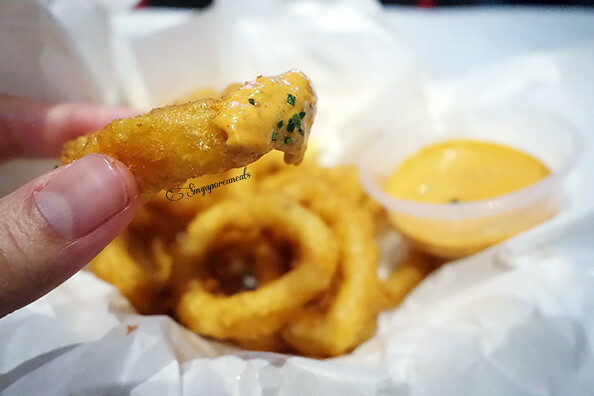 We could not get enough of these fresh squid beer battered ringlets! These hot and savoury rings went very well with the cool and tangy remoulade sauce. Washed down with beer, it makes the perfect pub grub. 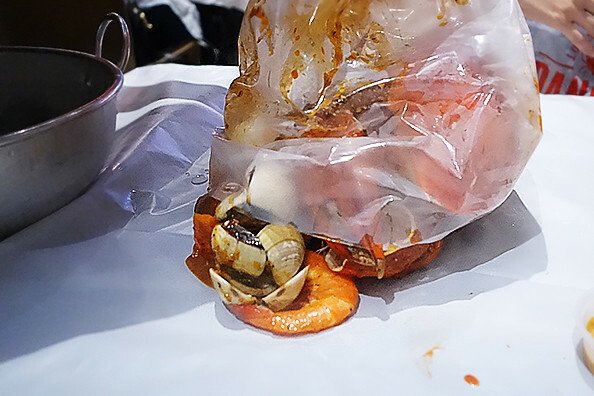 Combo Bag #1 with Sri Lankan crab, prawns, mussels, corn, potatoes and sausages at $88. 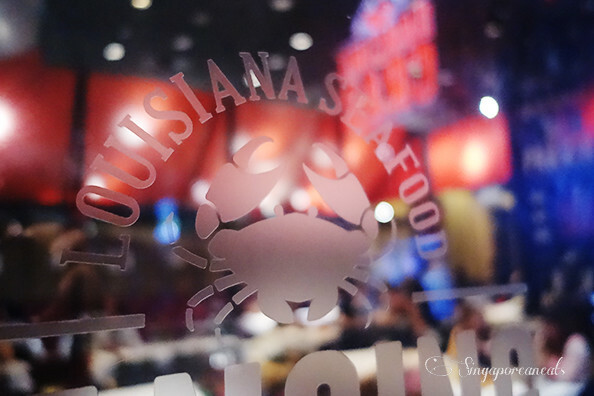 We chose the spicy sauce with additional side of garlic sauce (extra $2) and enjoyed every bit of the spicy cajun mix. 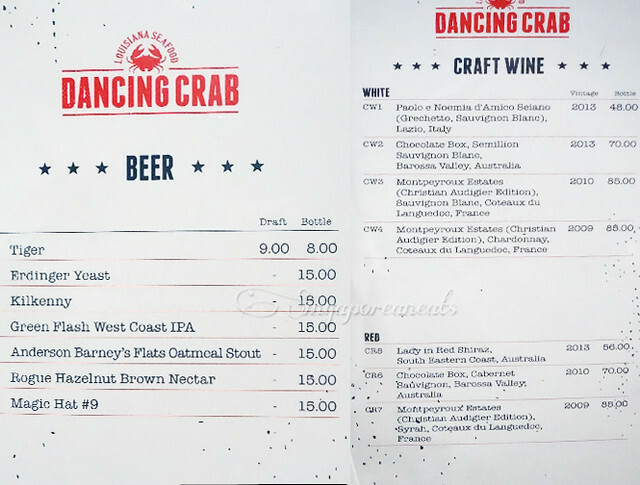 My favorite bits were the crab (fresh) and sausages (proper ones, not the cheapo cocktail stuff). You might want to ask for cutlery at least for stabbing the potato and corn pieces as it was too hot to handle at the onset with one’s fingers without searing your skin. A messy & delicious event, we thoroughly enjoyed it, and would not mind coming back for more. 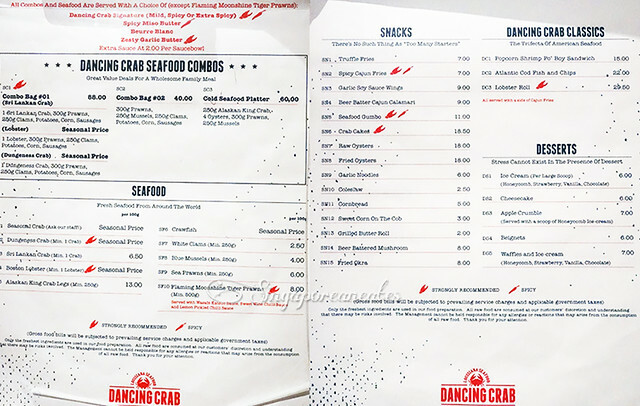 Lobster Rolls at $29.50. 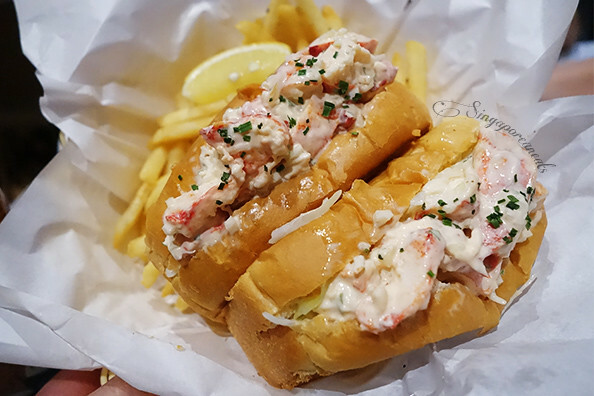 Imo, although they do great job with the soft and warm brioche here with the chunky lobster filling, I didn’t like the somewhat “chiller” taste of the mix. The fries were alright, but we much preferred their other standalone side dish of Truffle Fries at $7 (very nice). At the price of $29.50 it is a tad pricey but at least they give 2 rolls. But I think I prefer to save my moolah for Clifford Pier’s version instead. 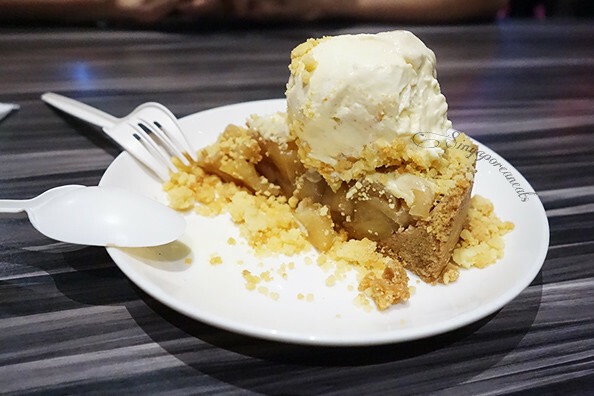 Finally, we finished with the Apple Crumble dessert $7. A classic American dessert, not too heavy or too sweet, just right to end the evening. Price-wise – Heavier on the pocket. Service – The only issue we had was that we were not offered nutcrackers for our combo when it arrived. We were told they ran out when we asked for it, and yet the table next to us had their set even though their meal had not arrived. Doesn’t make sense leh….? Ambience – Seeing tables and tables splatterd with sauces and empty shells makes for a casual and fun atmosphere. Music was the “clubbing” type (I half expected patrons to get up and dance), and it did get too loud at one point of the evening till we had to start shouting across the table. Still, overall we did enjoy that evening and would not hesitant to go back again for the combo, calamari & truffle fries. This time, we’d be sure to ask for the nutcracker up front instead of waiting for the kitchen’s next wash cycle to complete. Open Monday to Sunday. Check website for hours. 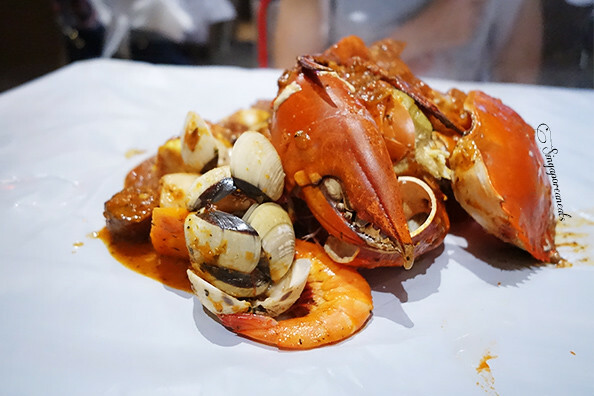 This entry was posted in Orchard Central, Orchard Road, Seafood, Singapore and tagged Cajun, orchard road, Seafood. Bookmark the permalink.